Leading German machining company, Haeberle, unveil their new automated production cell. Task: To develop a compact and efficient automated production cell for machining applications. 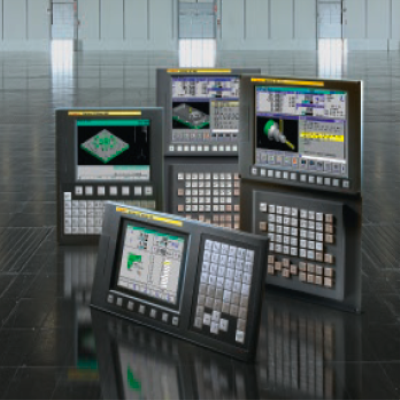 Solution: By integrating a smart storage system and a top-mounted FANUC LR Mate 5 axis robot into a compact cell with a FANUC Robodrill, CNC Haeberle have developed a dynamic new approach to multi-purpose machining. This cell arrangement enables the flexibility to respond to a range of lot sizes and undertake both sophisticated and high-volume machining tasks, and all on a very modest footprint. Result: An exciting new product with a dynamic variety of applications. In a new machining, CNC Häberle, both a contract manufacturer and a systems integrator, has combined new ideas with experience. The result is an automated production cell that will be unveiled at the AMB for the first time. Rainer Häberle is all too aware of the fact that for contract manufacturers, "long-term best-selling products" don't grow on trees, or rather don't grow on clamping chucks. That is why it's important to maintain a flexible range of machinery, in order to respond to demand and make money. At the AMB 2014, CNC Häberle, Laichingen, is unveiling the prototype of the cell considered ideal from the perspective of the contract manufacturer. Flexible in everyday use, requiring only a small footprint, tested turnkey-ready, and ready to put into operation without any assembly overhead. Once the assembly and run in phases are complete in Laichingen, the production cell is shipped to the customer "in one piece". There is no need for mechanics, electricians and programmers on site to use precious time discussing wiring or connections. Accept shipment today, start producing tomorrow – Häberle is finally turning this wish often expressed by users into reality. An additional advantage of the standardised design (depending upon demand) is a shorter delivery time. The basic idea of the cell is to be able to flexibly respond to different lot sizes. It is intended for small to medium lot sizes at the most. The combination of robot/storage unit offers the required flexibility and is economical due to the type of automation. It provides. Not only sophisticated work pieces with high tool overheads but also larger unit numbers with relatively simple specifications can be produced with equal efficiency. Rainer Häberle: "We want to build a cell that can do both, because as a contract manufacturer, we need both." And on as small a footprint as possible. These are compelling arguments for choosing the basic machine, a Robodrill α-D21LiA5, which already has a very modest footprint. The three-axis standard Robodrill was upgraded by Häberle, using proven and standardised axes, to a five-axis machine. A side panel of the machine is removed, and a carousel especially developed and built by Häberle is mounted as a storage unit. Placed in between them is an LR Mate 200iD in its new version IP67K. It manages the handling in tight quarters. The storage unit also offers powerful features. Five carousel levels can accommodate tools and work pieces. In a basic scenario, the twenty-one tool positions of the Robodrill are sufficient, then in the storage unit, per level up to twelve holders with pre-clamped work pieces can be stored. The decision to store tools and work pieces for machining, and thus occupy the carousel, does not have to be final. The levels in the carousel have drill holes with fits at regular intervals, in which appropriate holders can be mounted and replaced as necessary. This is also good for Häberle's bottom line: "I can assemble the machine almost entirely, including automation, until the customer opts for particular tool configuration in the final phase of machine assembly." And if the machining task changes after a while, the equipment can be adapted and the tools, for example, can be arranged in two rows instead of one per level. Appropriate brackets are then installed for that specific customer. The work pieces prepared with a zero point mounting system can be processed randomly and in any order sequence. To prevent having to also change the attachment for different work pieces, the work piece holders are all equipped with a standardised picking aid. This saves costs for different pickers and relevant overhead, even if a picker is changed in parallel during the machining time In the machine demonstration at the AMB, Häberle is showing various clamping units that can all be loaded into the machine with a picker. "If the needs of the operator go beyond the possible dimensions, additional pickers can naturally also be integrated. It's all a question of cost", says Rainer Häberle. The useful work piece size in this Robodrill cell is for parts with a volume of up to 150 mm x 150 mm x 150 mm. Häberle sees possible applications with this specification in medical technology – one possibility would be the machining of dental implants. In an application like this, numerous raw part discs are to kept on hand. The machining of implants such as these is complex, not least because the material is very hard. That is why in fully automatic mode, i.e. over the weekend, for example, counterpart tools are used that can be easily stored in the carousel. Examinations at which cycle times workpieces such as these can be machined, are among the services provided by CNC Häberle. Despite all automation: The standard "operating modes" also include manual loading. This is something a contract manufacturer has to do, "Nothing is easier than that" confirms Rainer Häberle. It is not required for the robot cell to be pushed to side, no additional safety door has to be opened. A totally normal unlocking button suffices for access if the part is to be clamped for processing. 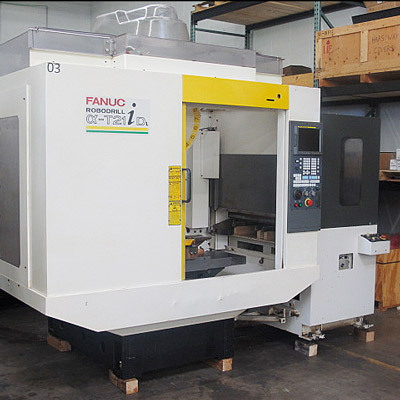 All the safety functions are ensured via the FANUNC CNC safety function. Switching over any existing Robodrill may not necessarily be possible, nonetheless. Because in order to offer the complete package this way, certain pre-configurations are necessary. Häberle's aim in doing so is to standardise as much as possible, and to manage with as few components and parts as possible. "It can't fail if it's not there in the first place." The 5-axis machine with 21 tool positions, a robot and a storage unit is thus also robust and can be efficiently used for a wide variety of machining tasks, thanks to its all-round qualities. For those preferring fewer options in terms of flexibility and storage slots, there is a basic 5-axis version without the robotic paternoster lift for pallet storage. "Everyone knows what the Robodrill control is capable of", says Rainer Häberle, confident that his customers are well informed. He says you could mention to them the fact that you can quickly process a line of code or perform quality contour smoothing, but "they know that already". There is one quality he expressly points out, however. "In normal operation, the robot can be completely controlled from the Robodrill." From his own production, he knows how quickly the operator sometimes needs to have access to a robot function. Perhaps only to open or close the attachment, because it picked up the wrong tool or to retract the tool after an emergency off. The teach pendant of the robot control is not needed for this. However, the robot has its own controller in the cell. The machine and the robot are linked via the internal FL-Net. Data and information are exchanged via the FL-Net interface, nothing more than a fieldbus link. This exchange is supported the function "Robot Connection" – of course it works both ways. Because just as the robot can be controlled via the CNC interface, information about the machine can also be queried via the teach pendant of the robot. The deployed robot is also new. For the engineering of the compact cell, Häberle received one of the first LR Mate 200iD models in the IP67K version. 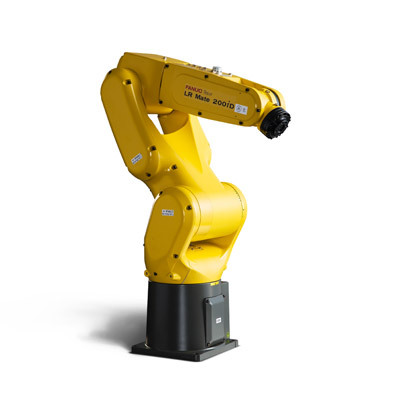 This FANUC robot is equipped so that it can be cleaned with high pressure up to 100 bar. The bearing / interior of the robot is under air pressure. This prevents the penetration of any coolant, and any chips whatsoever. The dead weight of 25 kg for a maximum payload of 7 kg at the wrist, and a reach of 717 mm are perfectly matched to the task. Also very practical is the plug connection on the underside. Because the robot is installed in the machine in a hanging position, the upward running connection cables can be laid directly out of the machine housing. How much other contract manufacturers appreciate Häberle's ideas will be seen at die AMB trade show.